The search for a new interim district superintendent took place over the summer following the resignation of our former superintendent last May. While the MSAD6 School Board considered a number of candidates, it ultimately decided to appoint former BEHS Principal Mr. Paul Penna to the job. The promotion may have come as a surprise to those who believed Mr. Michael Roy, the assistant superintendent had gotten the job. In reality, Mr. Roy had only been appointed interim superintendent for the remainder of the 2015-2016 school year, since Mr. Sherburne’s resignation came at an awkward time. ​ While the pool of applicants for the superintendency must remain anonymous, sources indicated that Mr. Penna did not face competition from anyone else already inside the school district. “The reason I did apply is [because] I did just recently finish my advanced studies program… and I feel committed to the district,” said Mr. Penna. Having worked in the district since 2013, Mr. Penna feels his advantage as an applicant was his familiarity with the staff and the district’s objectives. Mr. Penna completed a program of advanced study and educational leadership at the University of New England in 2014. His appointment was announced at the beginning of August and was followed up by a letter he sent to the BEHS faculty. Mr. Penna said he would continue to be accessible to the MSAD6 and high school communities. Like Mr. Roy, Mr. Penna was appointed on an ‘interim’ basis. He says this arrangement will give everybody – including himself – an opportunity to make assessments before finalizing a long-term deal. Mr. Penna admits there were some things he was nervous about at the beginning of this school year. As interim superintendent, it is now his responsibility to ensure the functionality of every aspect of the district – from the finance and maintenance departments to the transportation department and beyond. He also feels he has an obligation to all of the staff and students of the community. Should the job prove not to be to his liking, Mr. Penna says, his interim status leaves both him and the district a way out. Mr. Penna has spent time so far this school year travelling around the district and getting to know more of the teachers and students. On the day of his being interviewed, he had already visited all but one of the district’s schools. 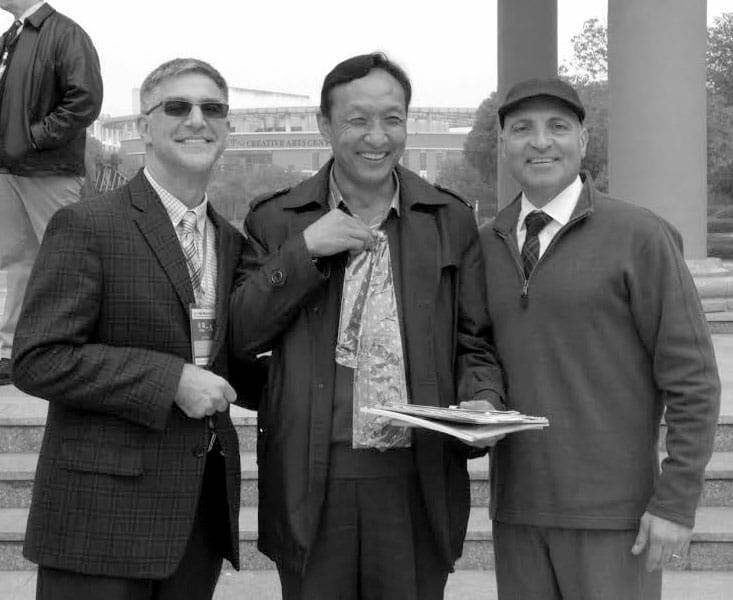 Mr. Frank Sherburne (left), then-superintendent, and Mr. Paul Penna (right) then-BEHS-principal, took a trip to China in 2013. Mr. Penna’s first year as superintendent happens to coincide with big developments for the proficiency-based education initiative (PBE). Mr. Penna has made it his goal to further the development and implementation of that system while also addressing some of the concerns held by parents, teachers, and students. Mr. Penna believes PBE will set the bar high in order to prepare students for a competitive global market. He also believes the school should provide support for those who may have additional variables going on at home. Another priority of Mr. Penna’s has been to ensure continuity in the district’s reporting system. With the exception of minor tweaks, he believes the report cards of all the schools in the district should be uniform. “People… definitely need to understand how and what we are reporting about their children and their [children’s] progress,” said Mr. Penna. Mr. Penna strives to make advancements even in spite of the recent comments made by our state’s governor. Governor Paul Lepage said on October 4th Maine has too many school districts and that he plans to pressure them into consolidating. Gov. Lepage stated Maine’s teachers and students are the victims of the state’s teachers union and superintendents association. His predecessor (Democratic Gov. John Baldacci) unsuccessfully attempted to consolidate Maine’s school system in 2008. Mr. Penna criticized Gov. Lepage’s comparison of Maine’s public education system to that of Florida, explaining that Florida is a different region and what works there might not necessarily work here. Nationally, Florida is not on the top of the list of academic achievement, and Mr. Penna is skeptical as to what Gov. Lepage actually thinks he will be able to do. “I wish… our Governor would support public education and make a statement to our citizens that he really does embrace it,” said Mr. Penna. While Mr. Penna has now earned the opportunity to make bigger changes in the district, a Superintendent is naturally far more estranged from his students than a principal. During his tenure as principal of BEHS, which began at the start of the 2013-2014 school year, Mr. Penna was a huge advocate of school spirit and student-administrator connections. Many upperclassmen will remember his high-energy performances during each homecoming spirit week for which he was principal. “The excitement and the enthusiasm of the students really help energize you and keeps you moving forward,” said Mr. Penna. To capture such energy this year, Mr. Penna says he has continued to support football games at the High School and watches other athletic activities at BEMS.